Update: 2017 Porsche Calendar Contest. This contest has ended and our winners have received their calendars. Be sure to subscribe so you'll be notified of our next contest. 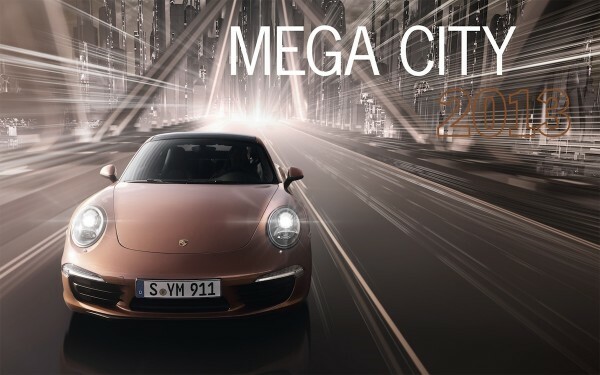 Our 2013 Porsche Mega City calendar arrived last week and it's just as good as we were hoping. We immediately gave it a place of honor in the office and added the included Porsche Calendar Coin to our growing collection. Even better, Driver's Selection from Porsche Design (yes, they recently changed their name) was in the giving mood and offered us some calendars for a giveaway. Read below to see how you can win 1 of 5 calendars. If you haven't yet seen it, Driver's Selection from Porsche Design has a new way of showcasing their products; it's called Select. Designed as an electronic magazine, Select does more than simply showcase various Driver's Selection products, it tells stories. The editorial team conducts research and uses the info from the vast archives at the Porsche Museum to provide history and heritage behind each product. In fact, it's a great source of Porsche trivia. If you would like one of the five calendars we have to give away, here's what you need to do. Simply click and view Select - the magazine in order to answer the following three questions (it's easier to read if you click the magnifying glass tool at the bottom once the new page launches). What product is featured on page 9? What year did Porsche start including coins with their calendars? How many components make up the 1:43 scale 911 GT3 RSR collector model? All the answers can be found in Select fairly easily. Simply give us your answers by 11:59 pm (EST) on Monday the 17th of December, 2012 by commenting on this post. We'll pool all the correct responses and then randomly select five (5) winners. We'll announce the winners here on this post and send an email to each person as well (so be sure you give us a good email address when you fill out the comment form) and your calendar will ship directly from Porsche. Anyone can play, but to be eligible to win a calendar you must live (or at least have a shipping address) within the U.S. That's it, enjoy the catalog, answer the questions and we'll send you out a calendar if you win. In 1962 the magazine included a medal for the first time. The 911 GT3 RSR collector’s model is made from 58 different components. 1, 911 Race Track set. I’m a diehard Porsche fan having owned and driven them for 25 years now. I’ve just got my tickets for Le Mans 24hrs 2013 and will be there in 2014 for the big Porsche comeback. Greatest cars on earth! 1 Porsche race track set with 2 GT3 cup cars (thinking if getting this. 2. Coins(medals) were first issued with the calendar in 1962. 3. There are 58 components to the 1:43 scale model of a 911GT3 RSR collector model. 1.What product is featured on page 9? 2.What year did Porsche start including coins with their calendars? 3.How many components make up the 1:43 scale 911 GT3 RSR collector model? Page 9 features a slot car set, coins were included in the calender starting in 1962 and there are 58 parts in the scale model. What product is featured on page 9? Porsche 911 GT3 Cup slot car race track set. What year did Porsche start including coins with their calendars? 1962 was the first year Porsche included the coins. How many components make up the 1:43 scale 911 GT3 RSR collector model? There are a total of 58 components comprising the 1:43 scale 911 GT3 RSR collector model. just love the layout of Select .. and of your blog. Answers I believe are: 911 GTR Cup Race track Set; 1962; and 58 components. 1) 911 GT3 Cup Racetrack set. I have many of these calendars! I’d love to add this one.